U.S. Wheat Associates (USW) supports free trade through multilateral, regional and bilateral trade agreements. 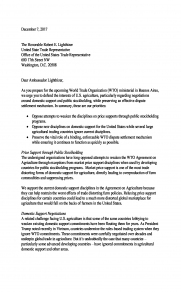 USW works closely with the USDA Foreign Agricultural Services (FAS) and the Office of the U.S. Trade Representative (USTR) to ensure favorable terms for wheat exports in all trade negotiations. U.S. 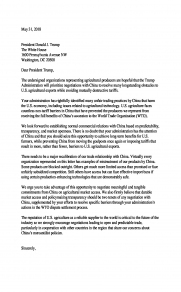 Wheat Associates (USW) supported the original Trans-Pacific Partnership agreement when it was signed February 2016, noting at the time that it would serve as a platform for trade expansion in the Asia-Pacific region. Subsequent withdrawal from TPP by the United States was a blow, but at least it did not change any existing market access arrangements. That changed when the remaining eleven members (TPP-11) signed an updated agreement without the United States on March 8, 2018. 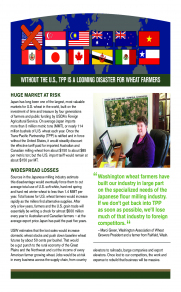 TPP-11 is a looming disaster for U.S. wheat farmers and related industries. 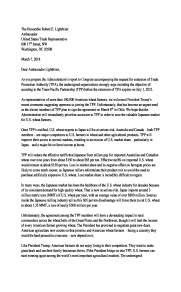 U.S. wheat exports to Japan – a critical market for U.S. farmers – will be at serious risk under TPP-11, setting up a catastrophic loss of sales. TPP 11 would gradually discount the effective tariff millers pay for imported Australian and Canadian milling wheat from about $150 to about $85 per metric ton (MT), putting U.S. wheat at a $65 per MT disadvantage. U.S. 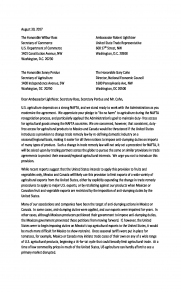 Wheat Associates supports reengaging with TPP countries to accede to the agreement as quickly as possible and prevent this massive loss to U.S. farmers. 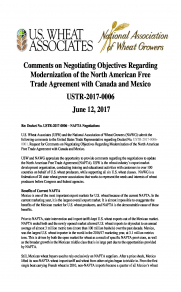 The North American Free Trade Agreement (NAFTA) entered into force on January 1, 1994. Tariffs on U.S. wheat went to zero and spurred fantastic growth in the Mexican market that is currently our largest buyer. With U.S. wheat farmers facing financial hurdles, open access to the Mexican market is needed now more than ever. 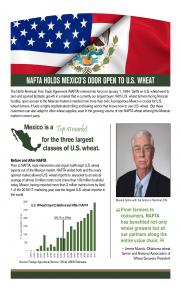 A prosperous Mexico is crucial for U.S. wheat farmers. It fuels a highly sophisticated milling and baking sector that knows how to use U.S. wheat. But these customers can also adapt to other wheat supplies, seen in the growing volume of non-NAFTA wheat entering the Mexican market in recent years. Prior to NAFTA, state intervention and import tariffs kept U.S. wheat exports to the Mexican market very low. NAFTA ended both and the newly opened market allowed U.S. wheat imports to skyrocket to an annual average of almost 3 million metric tons (more than 100 million bushels) today. In the 2016/17 marketing year, Mexico was the largest U.S. wheat importer in the world. The World Trade Organization (WTO) provides a framework for trade negotiations, settling trade disputes, and transparency of trade measures for more than 160 countries that are WTO members. All of these elements create a more predictable environment for buyers and sellers engaged in wheat trade. Particularly crucial for wheat trade are the WTO Agreement on Agriculture and Sanitary and Phytosanitary Agreement, among others. These agreements govern domestic support programs, import tariffs, tariff rate quotas, phytosanitary measures, export subsidies and several other aspects of agricultural trade. U.S. 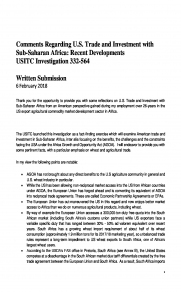 Wheat Associates’ priority for WTO negotiations is to improve market access for the wheat industry by lowering tariffs and removing non-tariff barriers. While the failure of the Doha Round means countries need to reassess how to move multilateral trade negotiations forward, the WTO remains an important institution to provide transparency, settle disputes, and liberalize trade. Currently, the United States has 14 free trade agreements (FTAs) in place covering 20 countries, most of which are net importers of wheat. Click here for a list of completed U.S. free trade agreements. U.S. Wheat Associates (USW) has always supported negotiating new trade agreements as the best way to lock in duty-free access while preventing competitors from gaining preferential advantages. 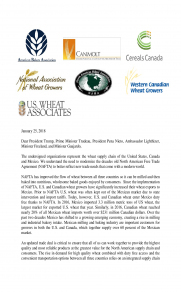 However, less than 40 percent of U.S. wheat trade is covered under FTAs, underscoring the need for new negotiations with new FTA partners, instead of focusing limited negotiating resources on NAFTA, KORUS and any other existing agreements. Learn more about the need for new trade agreements here.